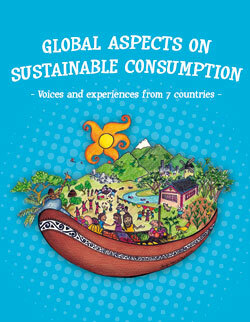 This publication brings together analysis, experiences and testimonies from community-based organizations, environmental NGOs and consumer groups working on sustainable consumption issues from seven countries and four continents of the globe. The source of inspiration for this publication was a meeting on Global Aspects on Sustainable Consumption held in Stockholm in August 2011, organized by the Swedish Society for Nature Conservation - SSNC, with partner organizations from Malaysia, South Africa, Tanzania, Kenya, Colombia, Ukraine and Sweden, as well as the participation of the global voice and network of Consumers International. The publication seeks to inspire others by giving a genuine, fresh and practical look at the challenges, concepts and contexts to forging sustainable consumption and production patterns within our communities. We believe it is vital to connect our local efforts with the work going on in other parts of the world: to cultivate a global and many diverse movement which focuses on the transition from consumerism to a new paradigm of sustainable societies. The stories highlighted in this publication show the beginnings of this path of change, based on real-life experiences of upholding cultural values and alternative community lifestyles; promoting popular education and rural - urban dialogue; implementing eco-friendly technologies and production practices; working with alternative and public media resources; and by advocating fundamental changes in public policies and political - economic structures for ecological - social justice.